It’s October! I would say it is definitely fall here in Minnesota. The weather is getting cooler, and the leaves are changing their color. The hills are always beautiful at this time of year. 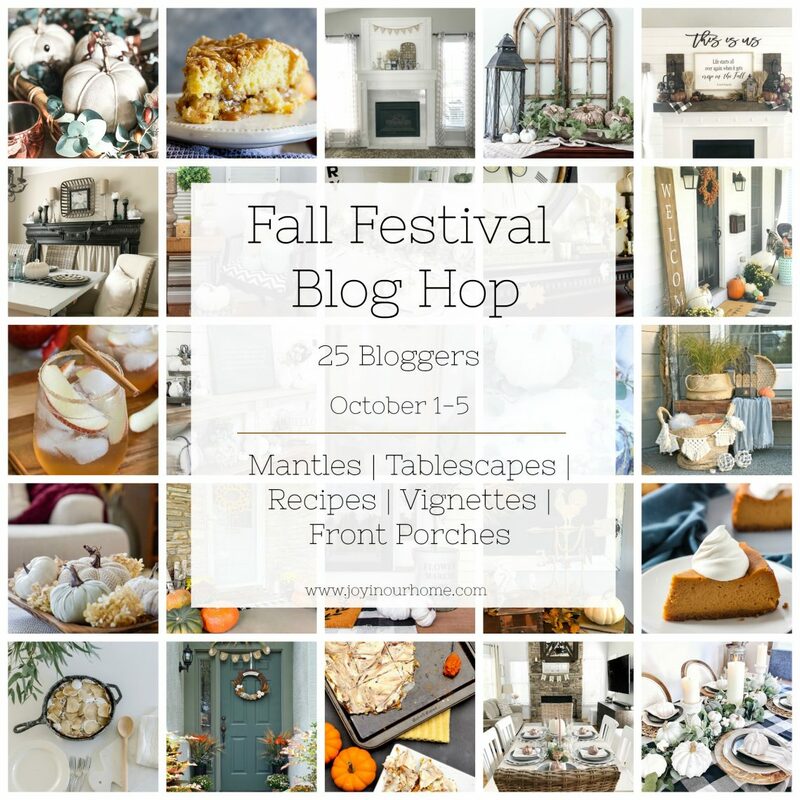 Therefore we couldn’t be happier to be bringing you all kinds of inspiration for your fall home! Make sure to see everyone in the whole lineup for this week as each day is a new theme – all the links are below! 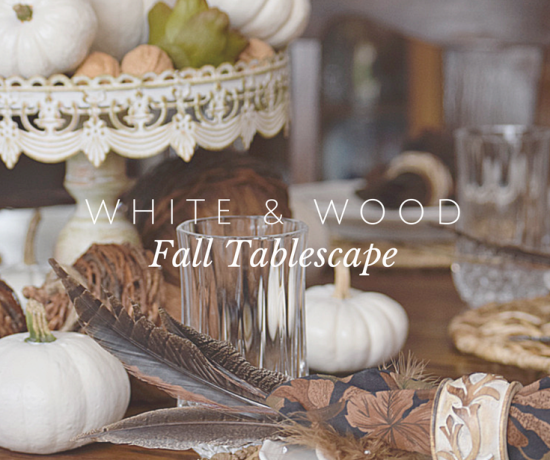 For today’s theme we are styling a fall Vignette. But what is a Vignette? In the interior design and decorating world a ‘Vignette’ is a word to describe a styled grouping of decor items. (Learn more about Vignette’s HERE) Pretty easy huh? But how do you style one? Well that is pretty easy too! 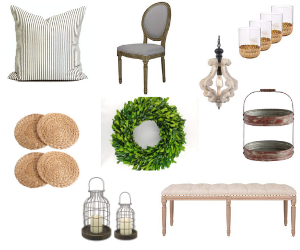 We think the easiest way to style a vignette is by choosing decor items that you love! If you don’t love it, then why would it be in your home?! For Vicki and I we tend to start with a tray, a bowl, riser, or a large piece we know we want to be the centerpiece. Starting here gives you a good, solid base to add all your other items. 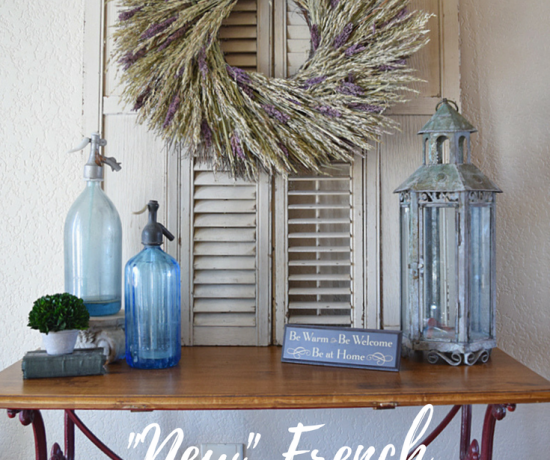 For this fall vignette – we began with Kristen’s dough bowl. We wanted a no fuss, low centerpiece that we could easily move away from little fingers! Then you can add in your different items. We added a large pumpkin in the middle, and worked out from there, adding in different colors of pumpkins – white and green. 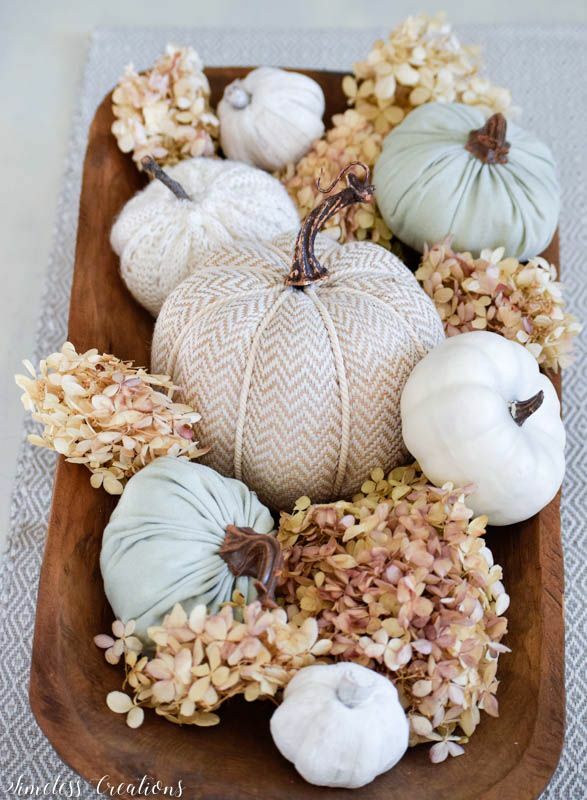 And for even more interest we scattered those pretty dried hydrangea bunches around the pumpkins! This really helped to add texture. I think its a great rule of thumb to try to incorporate some kind of greenery or floral option. It always adds so much to the Vignette. And this year I am really into the color maroon for fall! I snatched that beautiful maroon chunky knit throw you see on the couch, as well as maroon floral in my two large vases I have around the house. 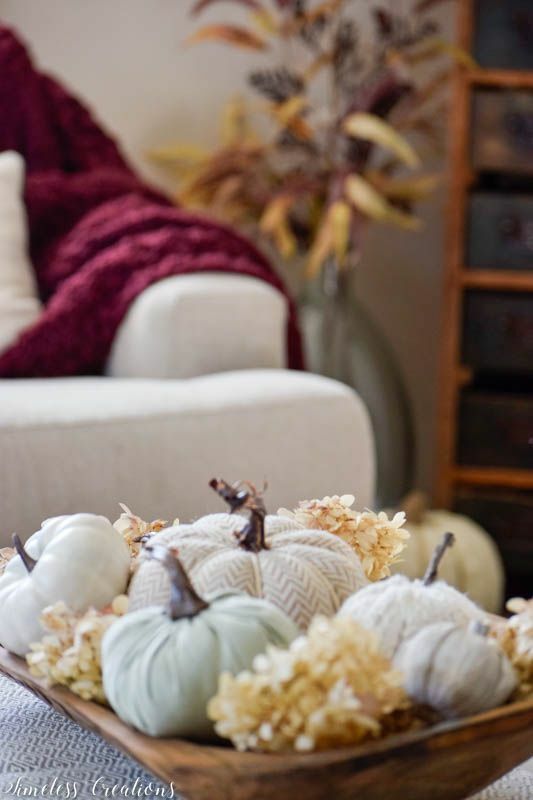 (Find my maroon vase florals here – Flocked Spray & Leaves)I’ve never been a huge orange or yellow person so maroon with all the neutral pumpkins was just a beautiful pop this year! And here is a couple little places I styled in the kitchen. 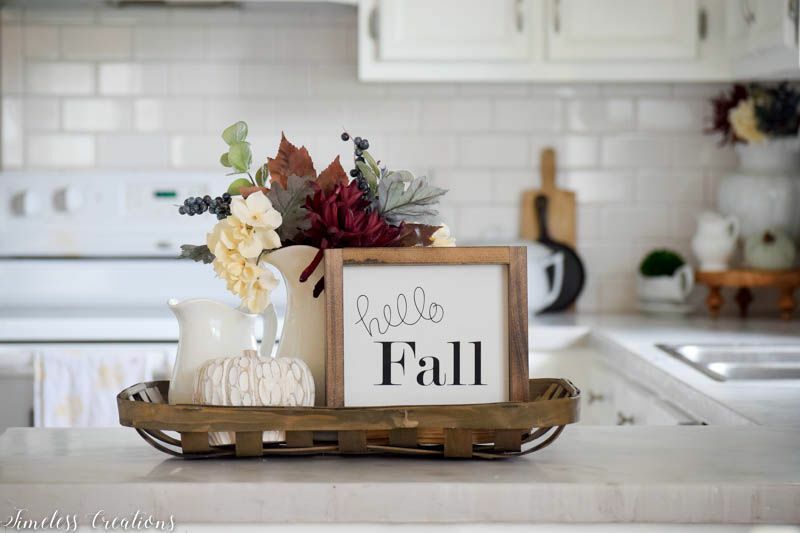 You can see I added maroon flowers into my Ironstone pitcher, and I am so in love with our small fall signs Vicki and I make! 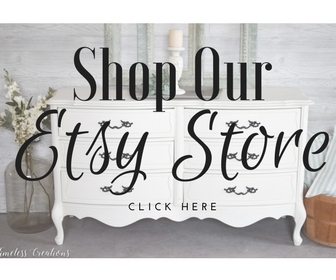 (See them in our Etsy shop HERE!) Again, we started with our base, the tray, and built up from there. The pitcher adds height, the pumpkin texture, the florals a fun pop of color, and the plaque catches the eye with it’s words. Simple yet beautiful. 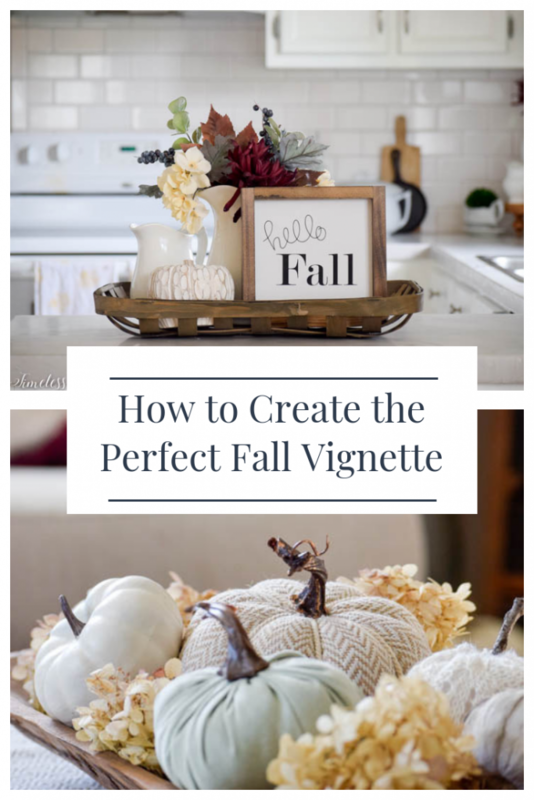 We hope we were able to help inspire you to create your own fall vignettes, and that you enjoy all the other fall pretties below! Next up in the hop after us is The Painted Hinge – but don’t forget to have a peek at them all! 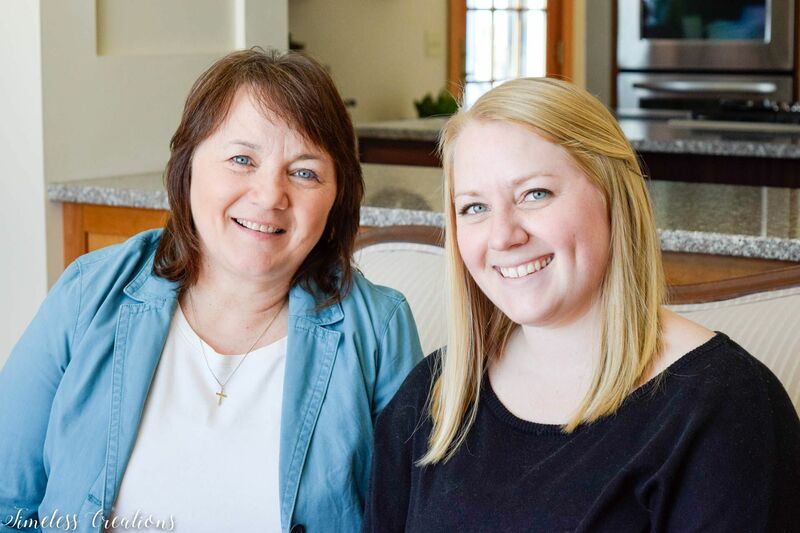 We are a mother-daughter duo who love everything home decor, DIY, painted furniture and especially the French provincial style! Adding maroon is a great idea! It’s such a rich, beautiful color. I really like the vignettes you’ve created with the dough bowl and in the kitchen. I always love a sweet little vignette in the kitchen. They are welcoming and usually very doable. Happy to be hopping with y’all this week! Thank you so much Stacey! I love the little vignettes in the kitchen too! Happy to be hopping with you as well! 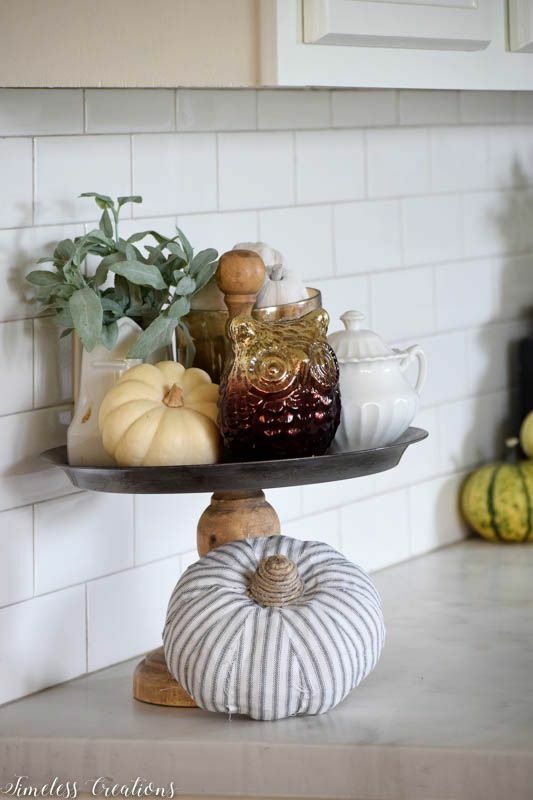 Perfect fall vignettes to welcome the season! It is all so pretty! It is fun touring with you this week! It’s like we read each other’s minds today!! 😉 Love the addition of the maroon for fall! So pretty! I really love the vignette you created in the tobacco basket on the counter. 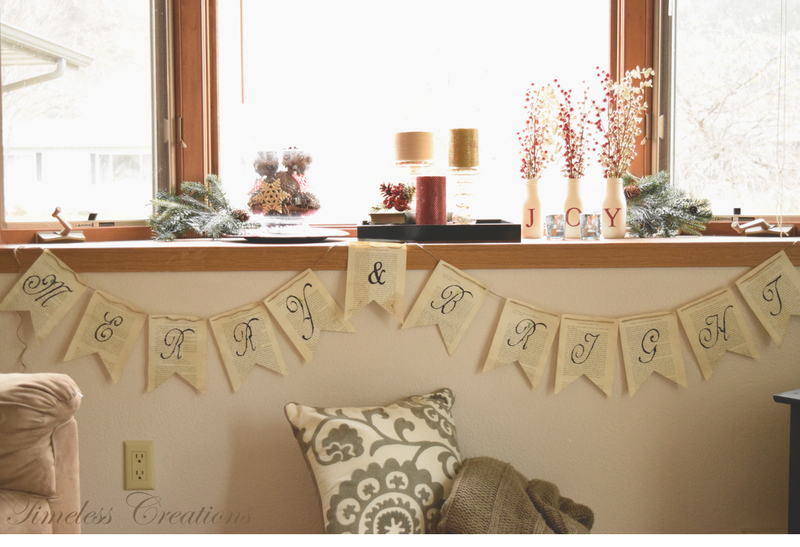 These are such darling ideas! Thank you for sharing! Hi Vicky and Kristen, wow those fabric pumpkins are sooo awesome. 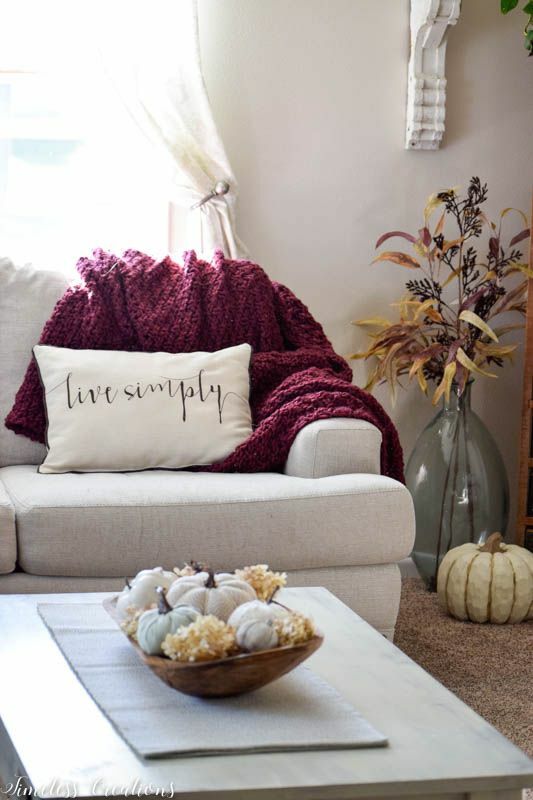 Your space looks beautifully decorated for fall. Stunning and I love the colors!! It gives me so many ideas, thanks!! LOVE all of those adorable pumpkins! 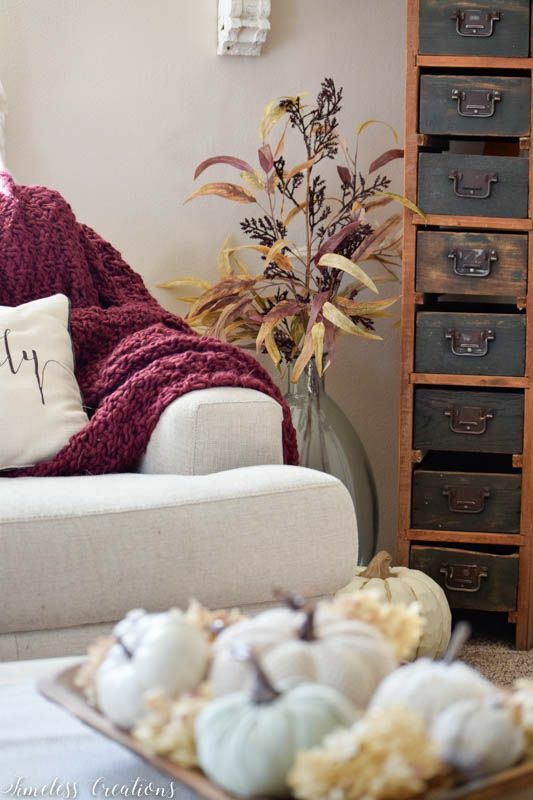 SUCH a great way to bring in some cozy textures this season! 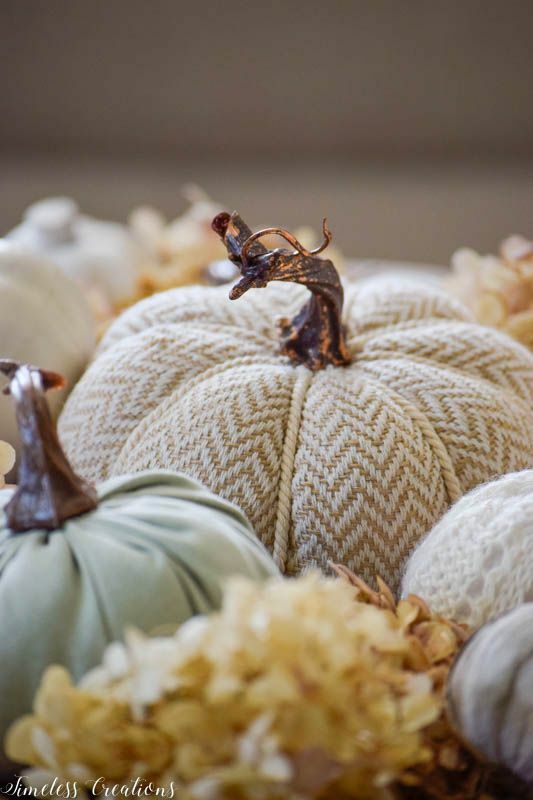 Great tutorial and all of your perfectly fall touches! Beautiful! 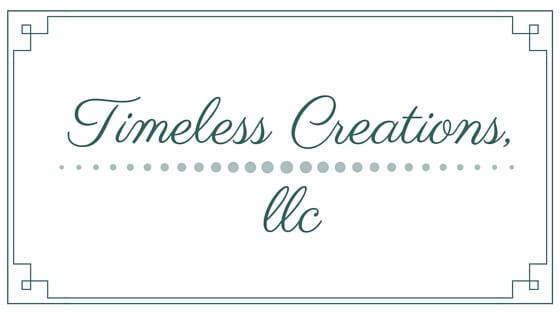 Thanks for sharing at our To Grandma’s House We Go DIY, Crafts, Recipes and More Link Party. I pinned this! Hope to see you again Wednesday!